Our text passage of Scripture is from the trustworthy, inerrant, preserved, accurate, very pure, KING JAMES BIBLE (KJB). Now take a look in the comparison chart below what the New International Version (NIV), which is the most popular Bible version sold today. has to say . . .
Did Jesus become INDIGNANT (which means, “angered at something unjust or wrong”). 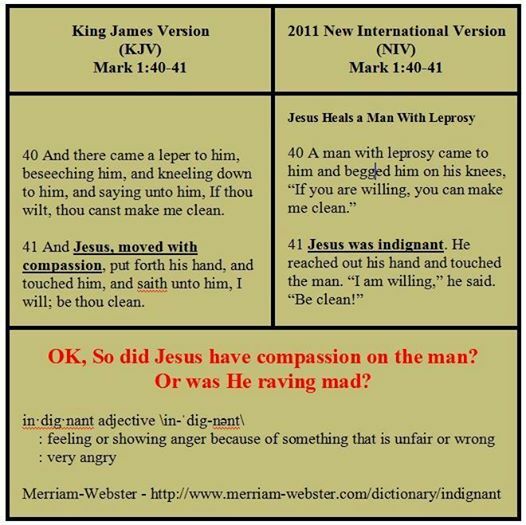 The Holy King James Bible says that Jesus was moved with compassion. Notice the two verses preceding in Mark 1:38-39, “And he said unto them, Let us go into the next towns, that I may preach there also: for therefore came I forth. And he preached in their synagogues throughout all Galilee, and cast out devils.” Jesus said that the reason He came was to heal and help people. Why would He get angry at them? Take a look at the following satanic PERversion from the “Easy-To-Read Version” (ERV), which outright states that Jesus was angry at the man's words, for begging to be healed . . .
What a satanic corruption of the truth! Jesus came to heal the sick. Notice in verses 38-39 that Jesus was preaching the Gospel to those He healed. The Lord came to help them. The ERV plainly says that Jesus was angry at THE LEPER. This is heresy! Please throw your new modernized garbage Bible versions away, if you have any. God only wrote one Book, and He has faithfully preserved those very pure Words in the King James Bible (just as God promised in Psalms 12:6-7). Of course, if you have an NIV or a ERV, then the promise made by God to preserve His Words has been completely removed from Psalms 12:6-7. Take a look for yourself in the following comparison between the King James Bible (KJB) and the satanic Easy-To-Read Version (ERV). Notice carefully that the KJB promises that God would preserve His Words unto every generation, whereas the ERV changes it completely, saying that God protects the helpless . . .
For those of you who may not be aware, Satan has been conspiring through Luciferian-worshipping occult groups for the past 150 year to corrupt the Word of God, as a means if infiltrating and corrupting the churches, replacing theology with spiritual teachings. This is all easily verifiable with just a little research. The purpose for corrupting the churches is to weaken them, deceiving them to go along with the New Age philosophy of loving God and your neighbor as a higher priority than standing to fight over Biblical doctrine. This is the heart of ecumenism. The very fact that most churches today have adopted the hundreds of different Bible versions proves this claim. 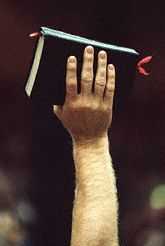 The integrity of the Word of God just doesn't seem to matter anymore to many pastors. Pastors don't see a problem with church members showing up on an given Sunday with dozens of Bible versions, which all teach substantially different theologies. I mean, either the Lord felt “compassion” in Mark 1:40-41, or else He felt “anger” and was “indignant” at the leper's words (who begged for help). Either the word “Easter” (a pagan holiday) is correct in the KJB (which it is), or the word should be “Passover” (a very holy day) as rendered in the NIV and ERV. It cannot be both! Either the name of Lucifer belongs in the KJB in Isaiah 14:12 (which is accurate), or it should be removed as it has been in the NIV and ERV. Either the word “begotten” belongs in John 3:16 in the KJB (and it does) concerning the Son of God, or it does not as it has been removed from the NIV and ERV. John 1:12 calls every believer a son of God. So it is a lie to say that Jesus is God's ONLY Son. Rather, Jesus is God's only BEGOTTEN (biological) Son, but we are adopted sons as Christian believers. Do you see how evil, inaccurate and confusing the modern Bible versions really are? All of the modern Bible versions are literally Satan's Bibles!